In June of 1937, Beijing became one of the first cities to fall as Japanese forces began their conquest of China. In contrast to the atrocities committed by Imperial forces during their capture of Nanjing in December of that year, residents of Beijing lived relatively peaceful lives after occupation. This included the city’s population of Westerners, who could move freely throughout the city even under Japanese rule. Arthur Hummel Jr., at the time a twenty-year-old English teacher, was one of the American civilians imprisoned by Japanese forces in Beijing. After being interned for three years, Hummel was finally able to escape in May of 1944 and would spend the rest of the war aiding a Nationalist guerilla group as it fought both Japanese and Communist armies. Inspired by these events, Hummel went on to join the Foreign Service, and was appointed Ambassador to China in 1981. Ambassador Hummel’s World War II exploits were recorded in a 1994 interview conducted by Charles Stuart Kennedy. HUMMEL (seen left): The Japanese had first sliced off Manchuria in 1932. Then they moved on to a full-scale war with China in 1937 and occupied all of the large coastal cities–Shanghai, Beijing, and so on. So they already occupied that part of North China. On Pearl Harbor day, December 8, 1941, in China and Japan, all of the American, British, Canadians, and so on, became “enemy aliens,” just as many Japanese here in the United States. There were huge city walls in those days, which have since been torn down…. We Westerners were certainly conspicuous after Pearl Harbor, because we all had to wear armbands, proclaiming that we were “enemy aliens.” If you had to go to a Japanese Government office for anything, when you passed the Japanese sentries outside, you had to bow. If you didn’t, you were slapped. However, I think that that was almost the only change from the past in that first year, when we were under loose internment, within the walls of the old city of Beijing. I don’t know the total size of the American community there, in Beijing itself. When we were rounded up more than a year later and sent off to an internment camp, quite some distance from Beijing, we had about 3,000 people there. This was the Western community in the North China area. 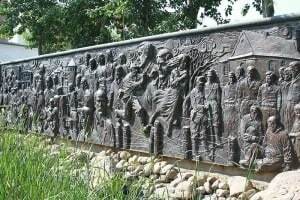 There were about 3,000 people, including more than 500 Catholic priests and nuns, who all wound up in the internment camp. I made two efforts…to escape from Beijing, but each fell through when the promised liaison with Communist guerrillas collapsed. We would need help in being taken care of and escorted across Japanese dominated territory on our way back to Chungking [the capital of Free China], and each time those who were in contact with the communists in the Western Hills nearby thought they had everything arranged, the Communist guerrillas backed out. 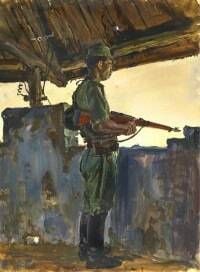 Eventually, on March 25, 1943–more than a year after Pearl Harbor (painting from Vellichor.org) –we were all rounded up and told to pack two suitcases which we could carry. We were sent off by train to a place in Shandong Province. Shandong Province is the one that more or less sticks out into the Yellow Sea toward Korea. The former Presbyterian mission compound at Weixian where they put us was pretty far away and rather isolated. It had a very large school and a hospital. We occupied the dormitories. 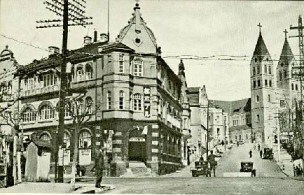 The Japanese guards lived in the adjacent area where the former foreign missionaries had lived. Life in the internment camp was really not all that bad. We were given the ingredients; equipment and fuel for preparing food, and most people were busy with camp jobs: cooking, cleaning, taking care of kids or running the school. I had a friend named Laurence Tipton (seen third from left), a British chap who…had worked for BAT, British-American Tobacco Company. He had had the foresight to bring along small gold bars and other substitutes for money. He and I–with my knowledge of the Chinese language, since he didn’t know much Chinese–bribed a few of the Chinese coolies, who were coming in and out to work in the internment camp. We asked them to carry and mail letters out. I wouldn’t have known whom to write to, but Tipton did. He had a lot of business contacts. He would write letters to them. We would talk to the Chinese coolies and ask them if they knew anybody we could get in touch with. Eventually, contact was made, but, oddly enough instigated by the guerrilla unit that we finally ended up with. They arranged to smuggle letters in to us, which promptly got into Tipton’s hands. Of course, it was immediately taken to our camp government. The guerrillas offered to come in with large forces and do away with the Japanese guards. They would quickly construct an air field; the Americans would come and fly us all away to Free China. This, of course, was a harebrained idea–not practical, for many different reasons. However, after the initial contact was made, we kept up with it. Eventually, it was decided by the camp government that a small group of probably two people would be given authorization by our camp management to escape and go to these guerrillas and establish contact with Chungking, presumably. The camp would then have a liaison base outside. The camp government decided that Tipton should be one to go. He was a seasoned China traveler with good judgment. A very talented Catholic priest who was older, spoke and wrote excellent Chinese (better than I could) was initially nominated to go along with Tipton. However, at the last moment the priest’s superiors were afraid–and they were right–that the Japanese might retaliate against other Catholic clerics, and he was forbidden to go and I was put in at the last moment. The arrangements worked well for getting out of the camp. Very simply, we had a small ladder which we used to get over a brick wall. We put a stepping stool outside, stood on that, jumped over the barbed wire, and we were out. All this while friends stood guard to warn us if the Japanese guard at that section of the wall was about to approach. We met a group of the guerrillas–some 10 of them–about a mile away in a clump of trees near a cemetery, which we had designated as a meeting place. The people in the camp waited until the afternoon to report that they thought that someone was missing. The Japanese got very excited and lined everybody up and counted and recounted them. I had been living in a large room with about six people. Three of my roommates, whose beds were nearest to mine, as well as others who slept near where Tipton used to sleep, were knocked about by the Japanese, but not very hard. They were put into a sort of makeshift jail. They were on bread and water, I think, for four or five days. After that, things calmed down, except that the Japanese greatly increased the physical security of the place. They dug a big, deep ditch and raised a higher wall. It would have been much harder and more complicated for anyone else to get out, and nobody else tried. The Japanese instituted several extra head-count lineups for about a month, and that was about all of the repercussions. The key was how close a camp was to Japan, and the oftener “Gaimusho” people, from the Japanese Foreign Ministry, could visit the camp. Foreign Ministry officials had a hand in advising the Japanese camp commander, who was a military man. The Ministry officials could not give orders to the military, but, by visiting the camps from time to time, they helped to ensure that conditions didn’t get too bad. We were in the camp closest to Japan–in North China. The internment camps in Shanghai were not good at all and were quite bad in some respects. In the Philippines the internment camp at Santo Tomas was quite bad. Singapore, as you said, and Borneo—the farther you were away from Japan, the worse off you were. Of course the civilian internment camps are what I’m talking about, not the POW camps. The commander [of the guerilla unit] had been a middle school teacher. He patriotically joined up with some force or other in the western part of Shandong Province, close to Hebei Province shortly after the Japanese attached China in full force in 1937. 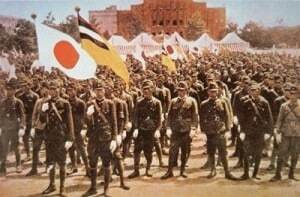 At that time there was a fervent movement to oppose the invading Japanese. In spite of having no military training at all, he and others obtained some weapons and were formed into units. However, they were rather ineffective and disorganized and were rolled over very quickly by the Japanese. Also very quickly, they began to squabble among themselves. With one thing and another, they had so many disasters that they wound up back in their own home, Hsien. They had no support from Chungking at all. 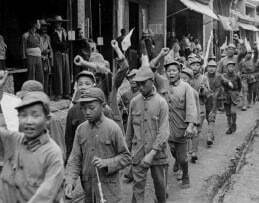 With no money–and few arms–they managed to start a very small scale resistance to local puppet Chinese troops, who occupied that area. This sort of thing happened all over Shandong Province. Shandong people are known for being tough, militant, and pioneer types. They’re the ones who colonized Manchuria, for instance. These little guerrilla units gradually put pressure on police posts and Puppet units—we used the term Puppet for Chinese who were collaborating with the Japanese. Gradually, the guerrillas spread out from tiny little areas, maybe just one village which was conspiring against the police and Puppet supporters. From time to time they would attack and rob a small police post, taking over another village or so. This unit, the 15th Tsung- Tui, had expanded to a point where, when Tipton and I arrived, there were about 8,000 armed troops in an area 10 miles by 20 miles. The Japanese didn’t come into the area, unless they were sent on mopping up expeditions. From time to time we would receive a warning that Japanese or Puppet troops were advancing on the border of our area. We would pack up everything that we could pack up and become mobile. They actually had machinery to manufacture bolt-action rifles and gunpowder. They would bury all of this stuff. Then they would wait and try to stay out of the way of the Japanese, until they left. There was no point in a frontal battle, which is what the Japanese were trying to force them into. Fundamentally, the Japanese would sweep back and forth through our area, sometimes for as long as two weeks, trying to capture the guerrilla headquarters and leaders. Tipton and I were considered valuable assets, and we were given nominal military ranks, and were regarded as Advisers. We sent a couple of messengers back by land who eventually arrived in Chungking and contacted the Office of Strategic Services (OSS) detachment there. Eventually, they were returned to us by air–by parachute drop. They brought money and some medicine for the [internment] camp, which the camp really didn’t need. We didn’t need the money, either. Plans were being made, right at the end of the war, for a large air drop of ammunition and a small unit of OSS troops–Americans to drop into our guerrilla area. The thinking was that it seemed possible then that American troops might be landing somewhere on the coast of China as a further step toward the defeat of Japan. There was no American unit in all of Shandong Province, and it could turn out very useful to have some Americans in place. Our unit was of course Nationalist, rather than Communist. There were also Communist guerrillas nearby, who had clear lines of communications all the way back to Yenan, their headquarters. By accident, we had been contacted by Nationalists. If we had wound up with the Communists, Tipton and I could have walked out through Communist territory and gotten back to Chungking, had we chosen to do so. But of course we were emissaries of the camp, and our purpose was to maintain liaison with the camp. The Nationalist guerrillas were split into quite a few separated, and sometimes hostile, groups. The Communist guerrillas were much more unified, and could use troops gathered from many of their “liberated” areas to mount campaigns to knock off the Nationalist guerrilla units, one by one. By this time, the fragile entente between Communists and Nationalists that initially was effective during the early years of their war (beginning in 1937) had broken down, as early as 1940. As the war dragged on, mutual hostilities were commonplace between Communist and Nationalist units and antipathies were high. In fact there was a three-cornered war going on, and it was difficult to say which side was more at fault. As the Japanese looked more and more like losers, the Communists in Shandong systematically started to wipe out Nationalist guerrilla areas one by one, with an eye on occupying more of the territory at the time the war ended. The Communist guerrillas drove us entirely out of our “home” area. 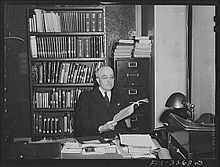 For the last 10 days or two weeks of the war Tipton and I were moving two or three times a day, keeping ahead of the Japanese in areas which were usually controlled by the “puppet” troops. I would say that in the areas where the Communists operated they were very highly organized and were supported by the people. They were Chinese, after all. They were very adroit in making sure that the people were the “water,” and that they were the “fish” to swim in that “water.” There was a lot of discipline, which you couldn’t say about the other guerrilla units. The other Nationalist units, except for the one I was with, had virtually all come to some kind of half way “live and let live” understanding with the Japanese and the “puppet forces.” I think that that was true of virtually all of the Nationalist guerrilla units. Maybe one or two had not done so. This is the excuse which the communists used–and still do–for attacking them and wiping them out, because so many of them were “running dogs” of the Japanese. That was not at all true of the unit I was with. I had never met the previous guerrilla commander, Wang Shang-chih. He had an opium habit and went to Tsingtao, the big port in Shandong Province, for an operation, of course under an assumed name. The Japanese picked him up and “converted” him. He was sending letters to his former subordinates in our area, advocating surrender to the Japanese, using the argument, “Why should we fight? It just means hardship for you,” and so on. He had a lot of prestige, originally, and more than the commander that I got to know. He was responsible for actually building up the guerrilla unit, and was well regarded up to that time. So there was beginning to be talk among the troops of our guerrilla unit that they should follow their former commander, stop resisting the Japanese, and have an easier life. The deputy commander of the unit, who moved up to be the commander, decided that surrender to the Japanese was intolerable, though he pretended to agree to it. He arranged a meeting on the border, with some Japanese and Chinese “puppet” officials, to which the Japanese brought this captured commander. At the right moment, just like out of a bit of Chinese history, “my” commander, the former deputy commander, surrounded the place with his own troops. He captured everybody, shot all the Japanese except one, whom they tortured for a time. They buried him alive, which was rather brutal, but standard for both sides. They captured their own commander, who, of course, had to be locked up or sequestered. We had access to radio reports, and indeed published a mimeographed weekly newspaper. We knew vaguely that something terrific had happened–some new bomb had been dropped on Japan, and then nothing seemed to happen for a day or two. We were getting garbled reports when the surrender of the Japanese actually occurred. There was a false report of the surrender–I think about two days before the actual surrender. As soon as it became obvious that the surrender had occurred, Tipton and I asked to be sent back to the internment camp and they immediately made arrangements to do so. We arrived the day after a bunch of Americans from OSS had been dropped by parachute–with food, supplies, and so on, in a relief effort for the internment camp. Marching back to the camp at the head of a column of uniformed guerrilla troops was quite an experience, and we were warmly welcomed. We then stayed in the camp until we were evacuated by air to Peking. This took about a month, because ground transportation was being sabotaged by Communist guerrillas who wanted to hinder any return of Nationalist troops to take over from the Japanese. I was asked by the camp authorities, now the OSS group, to lead a team outside the camp to liaise with the Chinese Communists nearby. The railroad had been cut in both directions, both to the sea and to Tsingtao, and the civil war was already starting between the Nationalists and Communists. We wanted to use the railway to evacuate the people in the camp. We trekked to a Communist headquarters and asked the Communists to lay off and even do some repair, so that we could get people out by rail. I spent two days with them in a nearby place as an official emissary from the camp. Finally, we had to be flown out from a local airfield. I flew out to Beijing. I can’t remember exactly why, after all of this, but I was so enamored by China that I stayed on an extra year, working for the United Nations relief program, UNRRA [United Nations Relief and Rehabilitation Administration]. 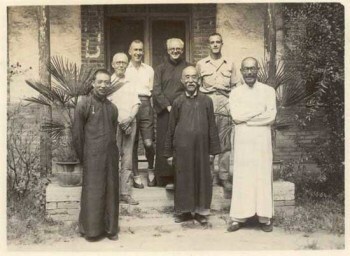 I was doing survey trips, mostly into Chinese Communist areas, to find out what was needed for relief there… Finally, I left China in June 1946. « The Return of the King — Saud Visits the U.S.